6 How much does it cost to go to Paris? When my daughter told me that she wanted to see the Eiffel Tower in Paris I was surprised for moment but then I thought: but of course, she is in the French school and they obviously talk about Paris, the capital of France. I quickly got excited and I told her: Ok, mama will plan 3 days in Paris and we will go and see the Eiffel Tower in Paris as well. 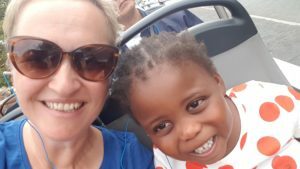 Travelling as a single parent of course has its challenges but I try not to get nervous about anything and just plan certain things to make sure we’re travelling safely and comfortably. Paris as a single mama with child would be a great adventure! NOTE: the links in this article will take you to booking sites for accommodation and activities in Paris. PlanetPilgrims earns a commission if you use the link to make your bookings. Of course you don’t pay more. 3 days in Paris seemed to be a good start, not to short, not too long, for our first big European city exploration. The best way to get from Amsterdam to Paris is to take the Thalys, the Amsterdam to Paris train. It is a high speed train that will take you from Amsterdam to Paris, to Gare Du Nord to be exact, is just over 3 hours. THIS would be my choice of transport to get from Amsterdam to Paris. It is fast and another big advantage from travelling by train is that you arrive in the middle of the city instead of an airport which usually ads another hour or so to your travel time and a lot to your cost. 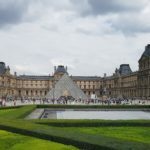 If you are going to Eurodisney then you can find an article HERE on how to get from Gare du Nord to Disneyland Paris. My daughter is quite nervous around dressed up characters so to go to Disneyland Paris would not be a good idea for us at the moment but I certainly hope that we can add a visit to Eurodisney in a couple of years. I mean, I would LOVE it! My next thing to find out was the best location to stay in Paris. 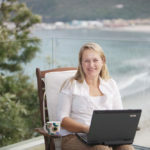 I had read several blogs who advised to stay in family friendly airbnbs. I love airbnb and I use it a lot but when I started browsing through all the options, I could only find places that were either on the 6th floor with no elevator or airconditioning OR check-in was only after 6pm. Europe was experiencing the hottest Summer EVER so I wasn’t keen on booking anything without aircon and walking up to the 6th floor where it was me carrying all the luggage, also didn’t appeal to me. So I moved over to some booking sites and did my research there. I put in a few filters and voila I found us a great little 3 star hotel smack bam in the middle of Montparnasse which in hindsight turned out to be THE best location to stay in Paris for Rosie and me. Find out below why. Planning three days in Paris with Rosie I would need to consider both her and my interests. 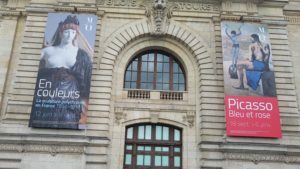 So what to see in Paris in 3 days? There are plenty of things to do in Paris with kids. The Eiffel Tower for sure, hop on hop off bus to quickly get a big overview and then I found a chocolate museum which I thought would be one of the great places to visit in Paris too. 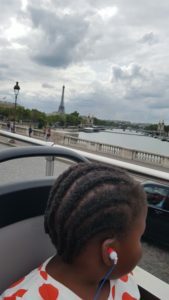 A boat trip on the Seine river was also on my list. And then of course it is best when you have such a great time that you’re not sticking to the plan that much. Day 1: We took the Thalys train from Amsterdam at 9h30 in the morning and arrived in Paris at Gare du Nord at 12h30. Upon arrival we got each a carnet of 10 Metro tickets. 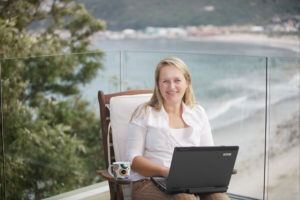 For a child aged between 4 – 9 yrs old, it is a reduced rate. 14.90 euros for mine and 7.50 euros for Rosie would get us around Paris for the next 3 days. Metro number 4 seemed to arrive closest to our hotel on a direct metro line from Gare du Nord. Going through the metro gates for the first time with a small child is a bit tricky as the gates close quickly so you have to position your child right in front of the gate, then insert the ticket. Be aware: the gates only open when you pick up the ticket and then quickly get through. Of course mama got stuck with our luggage but a friendly Spanish gentleman helped me get through. We arrived at the hotel in Montparnasse, Hotel Unic Renoir Montparnasse, at about 13h30, checked-in, dropped luggage in our rooms which looked neat, clean, spacious enough and perfect for the next 3 days. What I also like about a hotel is to have the reception desk right there so any quick questions, there’s always someone available. We found a metro station that was even closer and hop that one took us straight to the Eiffel Tower! By 3pm we had seen the Eiffel Tower for the first time. Of course it was very touristy and busy so when I saw a guy selling tickets for the Open Tour Hop On Hop Off Bus that seemed like a fantastic idea. Of course I paid the premium and I would suggest you buy them HERE online to save costs. There are 3 different routes on offer and we managed to do 2 on the first afternoon. The blue and green route. The Green route had a stop close to our hotel so we got off there, easy peasy. The Open Tour bus offers audios in various languages and they even have special audios in English, French and Spanish for children which I thought was great although Rosie didn’t really want to listen to them. I think the ear plugs might have been a bit uncomfortable for her. 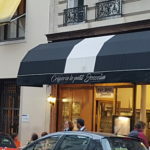 After we got off the bus, we went for a lovely diner at Leon de Bruxelles at the corner of Boulevard and Rue Montparnasse and a stone’s throw of our hotel. 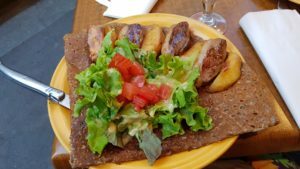 You can find them in a few areas in Paris and it is a great option to have dinner with children in Paris. They have lovely kids options. Rosie tried Mussels for the first time and totally loved them! She also got a toy. I also enjoyed my Moules Frites so win-win for everyone. I don’t like the typical kids’ meals that are usually on offer so I was very pleased with the Musselpot for Kids. 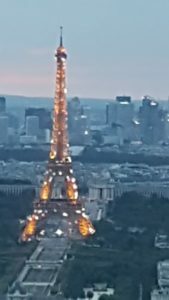 You would think that my 6 year old was now completely tired but she was determined that we should go up Tour Montparnasse to see the the Eiffel Tower at night. The disco lights of the Eiffel Tower are switched on from sunset each hour for about 5 minutes and one of the best places to watch the Eiffel Tower at night IS from Tour Montparnasse, just around the corner from our hotel. Tour Montparnasse itself was slightly dodgy to me, I mean it must be THE ugliest tower EVER but the viewing deck to see the Eiffel Tower at night is perfect. Another tick off our bucket list for Paris. Wow! What an amazing first day. Now off to bed to sleep. 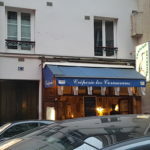 If you’re looking for more tours in and around Montparnasse, you can find them HERE. The roaring 20s walking tour sounds like loads of fun! Day 2: I had booked skip-the-line-tickets for the Eiffel Tower for today. 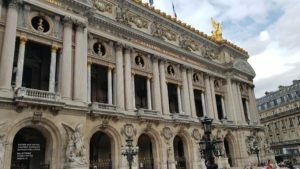 Be aware that when you book these kind of tickets you will only hear on the day early in the morning at which time you’re expected at a certain meeting point close to the Eiffel Tower. So this morning I received the email that we would need to meet at 3h30 pm only. I had heard horrific stories of the lines to get tickets and that was one thing I didn’t want to go through with Rosie. She can get quite anxious with tons of people around her so I didn’t want to prolong this. It was a good investment to get those tickets. We were met by a guide at a nearby cafe from where she took us through the first security, explained a lot of things and then brought us to the last security check. So even though you have skip-the-line-tickets for the Eiffel Tower, there will still be a line for security checks. Book online HERE for SKIP-THE-LINE-EIFFEL TOWER TICKETS! Waiting in line for your tickets is so yesterday so why not skip ALL lines of things to do in Paris? You can find skip-the-line-tickets for many other activities in Paris HERE as well. So now we had most of the day free to do whatever we wanted. We decided to have a leisurely breakfast close to the hotel which turned out to be a complete rip-off. 16 euros for 2 lousy fruit salads out of a can. I thought the breakfast in the hotel would be too expensive but it turned out they only charged 10 euros for a massive breakfast and no charge for Rosie. Another great advantage of staying at Hotel Unic Renoir Montparnasse. Breakfast included: Croissant, Pain au Chocolat, French bread rolls, yogurt, orange juice, coffee or tea, cold cuts and cheese and even scrambled eggs and sausages or bacon. No brainer that we had breakfast at the hotel the next 2 days. After breakfast I thought it would be a good idea to give Rosie some playtime at Jardin Du Luxembourg. Day 1 had been quite hectic, doing many things that I wanted to do, so this morning we would go and play. What a GREAT park!! Wow! I felt so lucky that we could spend so much time here. 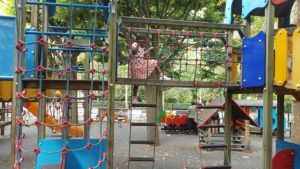 The park is one of the best free things to do in Paris with children or without children. If I would have been by myself, I would have enjoyed bringing a book and just read a couple of hours in any of the beautiful spots. During our 3 days in Paris, I think visiting the Jardin Du Luxembourg was one of our favourite favorite places to go in Paris. 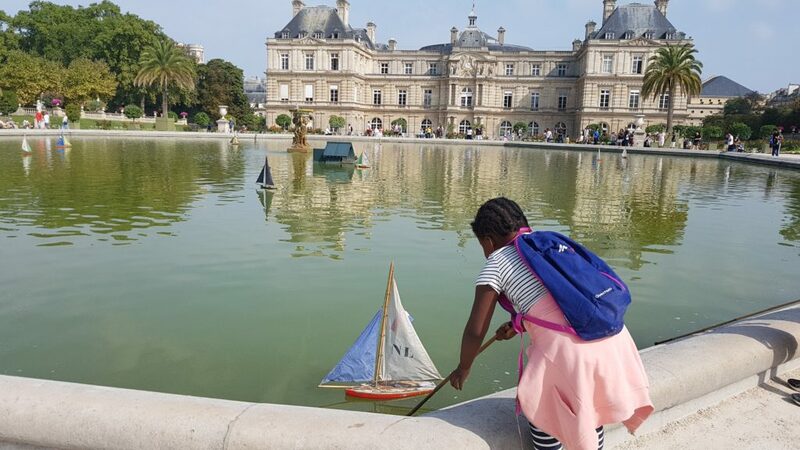 Perhaps for some people it seems a bit of an unusual thing to do in Paris but for families travelling with children to Paris, the Jardin Du Luxembourg is definitely one of the best places to see in Paris. We first went to the playground which has a section for the small kids and a separate one for the bigger kids. There’s a small entrance fee of 2.70 euros for the kids and 1.50 for the accompanying adult. For that you have a safe well fenced playground with lots of shade, benches to relax a clean toilet and you can buy a coffee at the kiosk. 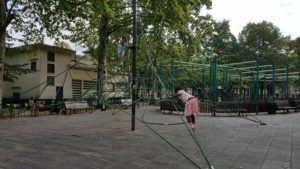 Many parents who live in the area take their kids here and bring their own picnics so it is a perfect outing in Paris and you should really plan to go when you spend 3 days in Paris. Next to the playground the kids can enjoy an old fashioned carousel. The first day Rosie didn’t want to go so we went back the next morning for a bit to find out that it only opens around midday. It is great fun and Rosie wanted to go 3 times once she was no longer scared. Each ride is 1.50 euro. She caught 16 rings on her last ride! Very proud of course! Metro 6 took us back to the Eiffel Tower within minutes and then we had to find the cafe. Because of security reasons the Eiffel Tower is fenced off now almost completely and you can only get inside the ticket area through security lines. So it took me a while to follow my Google Maps to the correct Cafe. Anyway, we got there and then I made the mistake to sit down and order a coffee (6 euro) instead of getting it at the bar (1.50). So sometimes you will have those expensive lessons while visiting Paris. Going up the Eiffel Tower was a dream come true for both Rosie and me. We had tickets to get up to the 2nd floor. I didn’t get to the top because I wasn’t sure if Rosie was going to be scared or not. She wasn’t and actually quite upset we weren’t getting to the top.. anyway, there’s always a next time. We spend some time on the 2nd floor, taking in all the views and then walked down to the 1st floor. Of course the Eiffel Tower is one of THE places to visit in Paris and we absolutely enjoyed our visit. Rosie got to pick a little souvenir in the souvenir shop so everybody happy. Since day 1 was such a long day, I didn’t plan any other activities for day 2 in the evening. 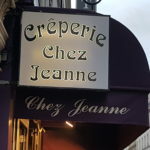 We went back by metro to the hotel area which turned out to be the area to eat the best crêpes in Paris. The hotel was surrounded by lovely crêperies and Rosie got to choose which one we would go to for dinner. Rue Montparnasse really is a lovely street and I felt like I wanted to live there for a bit. 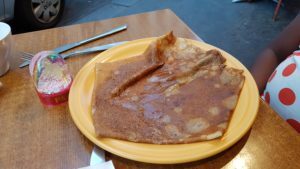 Rosie choose the crepe with Nutella and I choose the Crêpe Du Jour which was served with duck breast fillet, apple and a salad. It was a lovely dinner and within 5 minutes we were back in the hotel. We had walked over 10 km this day so we needed to rest our legs and I let Rosie enjoy the kids channel on TV. This morning we went back to Jardin Du Luxembourg to discover that the carousel only opened much later. After some convincing Rosie agreed that we should come back later in the afternoon. We are morning people so were out and about by 9h30am when we left the hotel after a very good breakfast. Full tummies all the way. I wanted to walk to the Jardin De Plantes which is another great park if you’re visiting Paris with kids. 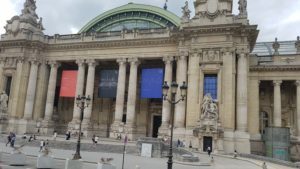 There are a lot of things to do in Paris with kids and since the weather was absolutely stunning I didn’t feel like visiting any museums but rather stayed outdoors and explore Paris on foot. So off we went and wanted to leave Jardin Du Luxembourg on the other side. We then came across this beautiful pond where kids were pushing little sailing boats around. It was beautiful! Rosie wanted to push a boat and managed to spot the Dutch one, yeah, that’s my girl. I paid 4 euros which gave her half an hour to sail her boat. It was one of the most fun things to do in Paris with kids. Walking to the Jardin De Plantes was slightly longer than I had imagined. I would have loved to spend more time strolling through the little streets but with a 6 year old things are just slightly different. We spend about 30 minutes watching the windows from a comic book store, LOL. By the time we got the gardens we needed the toilet, were hungry and really felt like an ice cream. Instead of lunch we bought HUGE ice creams which sorted us out for a bit. 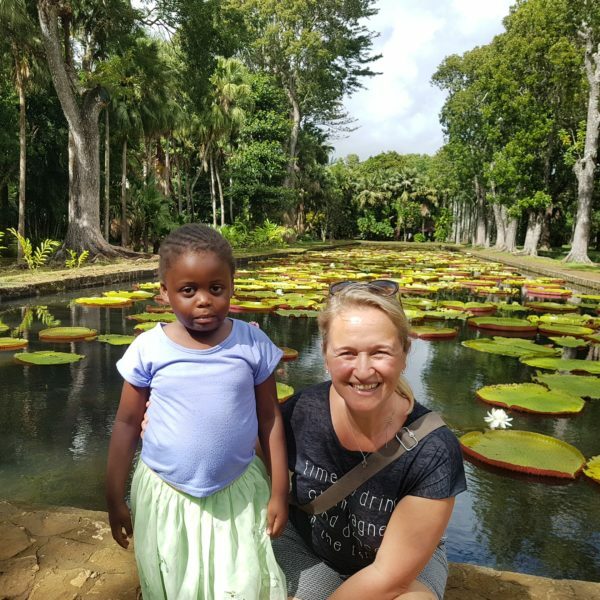 There’s a zoo in the Jardin De Plantes which seems one of the lovely things to do in Paris with children but living in South Africa where we have fantastic game reserves this didn’t appeal to us. 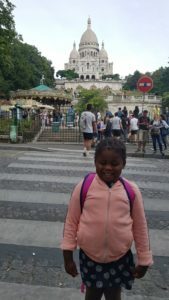 We found another carousel but it wasn’t as pretty as the one in Jardin De Luxumbourg so….. we found the closest metro station and then headed back to Jardin de Luxemborug where Rosie FINALLY could get onto the carousel. She enjoyed 3 rounds and I cheered her on. Dinner was had close to the hotel. I enjoyed a delicious Carpaccio with side salad and French fries. Beforehand Rosie’s dream of Burger King came true and she could have a happy meal for the first time in her life…. so sweet (but this is not going to be a regular). Our Thalys was only departing at 3h30pm so we could still explore Paris the entire morning. Gare du Nord is situated very closely to the Sacre-Coeur and Montmartre. We checked out from the lovely Unic Renoir Hotel, got in the metro and dropped our suitcase at the luggage storage at Gare du Nord. For a small suitcase the charge was 5.50 for 24 hours. The metro then took us a little bit closer even and the last bit we walked to find the little train that took us up to the Sacre-Coeur. It is a beautiful site and one of the highly recommended places to visit in Paris. For the funicular you can use a metro ticket. I didn’t have a problem climbing the 300 steps to the Sacre-Coeur but I thought the funicular would be much more fun for Rosie. It only took 1.5 minutes to go up. 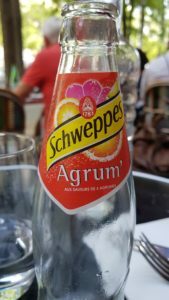 We then walked back all the way to Gare Du Nord where we spend the last couple of hours having lunch and relaxing. I think Rosie was exhausted by then and ready to go home. If we would have had 4 days in Paris, we would still have visited Centre Pompidou. 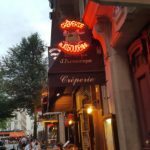 If you’re planning on doing as many activities as possible in Paris it might be good idea to get the Paris Pass which includes over 60 attractions in Paris. You can get passes between 2 and 6 days. Get more information and prices HERE. 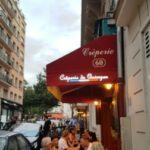 How much does it cost to go to Paris? 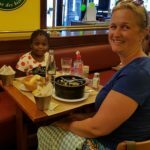 As difficult as it is to answer this question, I will give your our overview so that you have an idea of how much it costs to go to Paris as a single parent and one child. See our expenses below in the table. Of course you can do it cheaper, more expensive which ever way you want. When we travel I don’t always want to watch the budget especially with once in a lifetime experiences but I also don’t like to be ripped off so take this as an average. If Rosie would have been a bit older, I would definitely have wanted to try one of the fancy restaurants in Paris but with a 6 year old that’s just not a clever choice. There are still many things that I have on my wish list for Paris so I think we will plan to come back when Rosie is in her teenage years and then do all the things that we didn’t do now like visiting the Louvre and going on a day trip to Versailles which both are still on my bucket list for Paris. 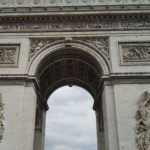 This entry was posted in Blog, Destinations and tagged paris.